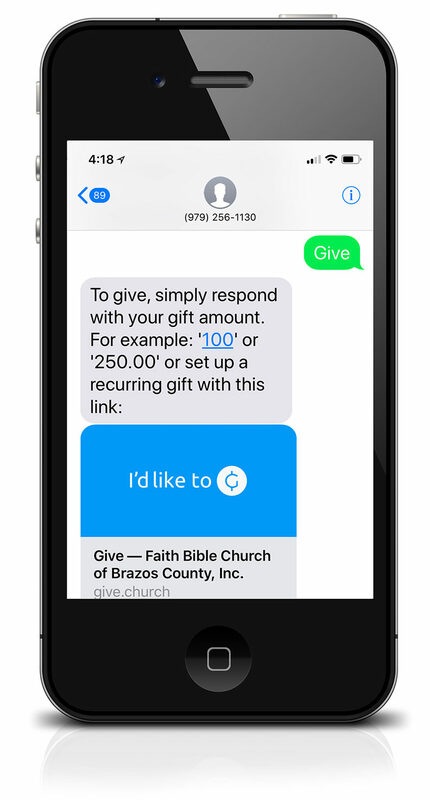 If you feel led to financially support the mission and ministries of Faith Bible Church, 3 options are available: 1) text, 2) online, and 3) cash/check. 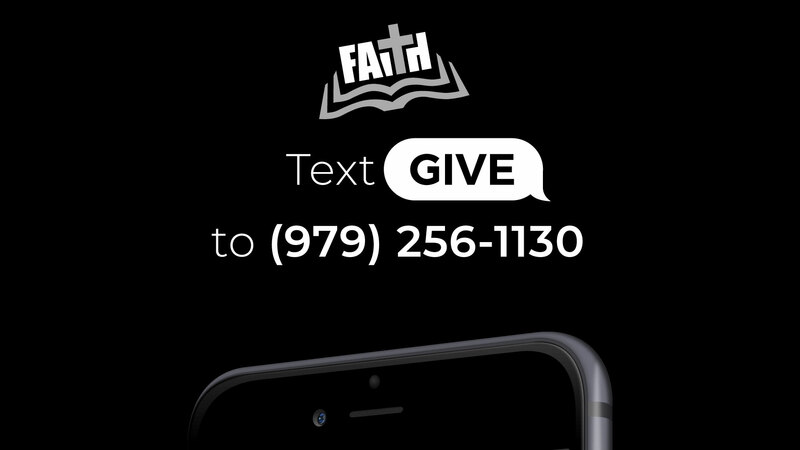 To make a secure gift, text “give” to (979) 256-1130. You’ll be asked to register with bank acocunt/credit/debit card information your first time. After you setup your account, simply text your gift amount for all future gifts. Don’t forget to save the number in your phone. You can always text “edit” to update your information, set up a recurring gift and check the status of a gift. If you make a mistake, text “refund” to (979) 256-1130 within 15 minutes to cancel your last gift amount. After the 15-minute window, you can contact us at giving@brazosfaith.org to request a refund. To securely give online, click here. You will need to register and provide your mobile phone number. A verification code will be sent to you each time you login. Your giving will be linked to your phone number (which becomes your username). Once logged in, you can manage your account, view your giving history and set up reoccurring gifts. We pass an offering plate each Sunday during our regular worship service. If you can’t join us on Sunday morning, you can mail your check to “Faith Bible Church, 1282 FM2776, Bryan, TX 77808.” Please do not send cash through the mail. You may designate how your gift will be spent according to one of three approved categories. “General Offering” gifts will be applied toward the ministries and missions of Faith Bible Church, including salaries, utilities, programs and foreign missions. “Building Fund (Debt Reduction)” gifts will be applied toward debt payments on the Faith Bible Church Facilities. Once the debt is retired, these funds will be applied toward future building programs. “Mission Fund” gifts will be applied toward the evangelistic missions of Faith Bible Church, including foreign missions.